Chelsea saw off a great challenge from Bournemouth to progress to the last four of the Carabao cup. This however came at a cost as the Blues had to labour to get the much needed result. The 2-1 win over Bournemouth to progress was one Chelsea never expected to go to the length it took them before they could get the victory. Antonio Conte put out a much different team out against the Cherries compared to their last game in the league against Southampton. Gary Cahill, Willian and Pedro were the only three to keep their places, while youngster Ethan Ampadu and Michy Batshuayi were handed starts. This however did not stop Chelsea from racing into the lead early on in the game. Willian struck just 13 minutes into the game after a beautiful team play allowed Fabregas release a sumptuous pass to the Brazilian who beautifully converted from close range. 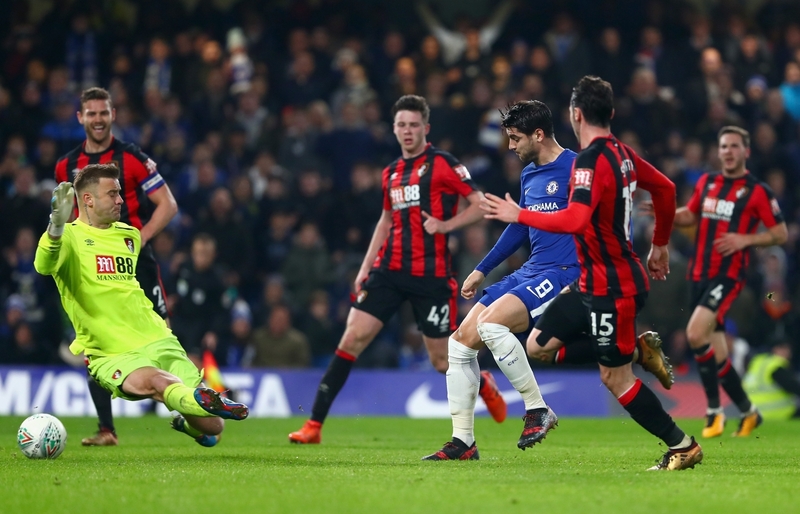 It was all rosy for Chelsea in the game as they continue to dominate all through the first half of the game and Bournemouth had no answers to their questions. It was in the second half Bournemouth showed some intent of an attacking team and were threatening. The Cherries finally got the equaliser when Chelsea would have thought they have won the game. The goal came in the 90th minute through Dan Gosling and left Chelsea deflated. It was a sweet moment for Bournemouth and they would have believed they are taking the game to extra time. Substitute, Alvaro Morata had other plans. The Spanish forward came late on and got the winner in the first of four added minutes. It was a moment to remember for Chelsea faithfuls. The Blues will now face Arsenal in the semi final of the Carabao cup and hope to book a place in the final and win the first trophy of the season.